Why, for instance, can one hit a great shot on one hole and then on another hole, with the same club, hit a dismal shot. Reviews suggest to me an absence of trust, or confidence, in the shot one was about to take. The late and great teacher / life philosopher Harvey Penick offered this advice about confidence in his Little Red Book: “Take Dead Aim”. Well, taking dead aim absent full trust equates to a very marginal result no matter the level of the golfer. Before taking dead aim the golfer must be fully confident in what they are about to execute which equates to a deep inner trust of their capabilities. The objective of TQ™ is to prepare the golfer as thoroughly as possible so that when they recall the words of Harvey Penick they can take dead aim with confidence. Through the digestion of many a GPA™ plus analyzing areas to help a golfer focus on for training it became obvious that the degree of trust a golfer has before they take the shot is a strong predictor of success. This trust can be determined, taught and defined as a Trust Quotient or TQ™. The higher the TQ™ the more likely the outcome matches the golfer’s expectation. The questions used to determine the confidence in each of the above key elements can be captured in a fashion which illustrated the importance of focus and what taking one shot at a time truly meant. A reasonable TQ™ for a Level 4 or beginning golfer would be greater than 24 on the scale. 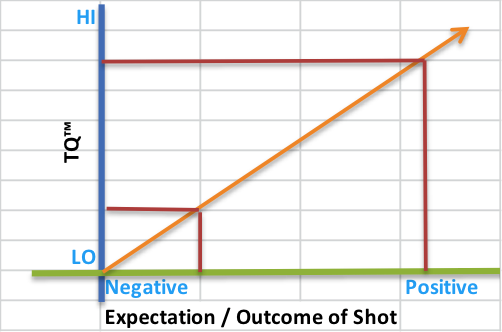 A failed shot typically happens when a TQ™ fell below 24. The teaching or coaching direction is to build up higher TQ™ in the golfer to help assure the success of the shot. The golfer must integrate the feeling of a high TQ™ or default to alternative actions such as stopping and / or re-setting the shot. If any of the factors contributing to TQ™ fall into the red or yellow zone, the golfer must yield and re-think their routine. Below please see a linear representation of TQ™ as described above. The concept of TQ™ is also applied to putting with a different set of factors making up the scale. 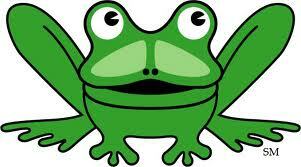 Putting success weighs heavily upon a golfer’s confidence and trust in every minute detail of the putt. Putting demands a high TQ™ regardless of whether the putt is 60 feet or 6 inches. This is what makes putting uniquely different than other shots taken on a golf course. A high TQ™ on the greens generally transfers to the next tee. Confidence begets confidence. The putter’s TQ™ is defined below. 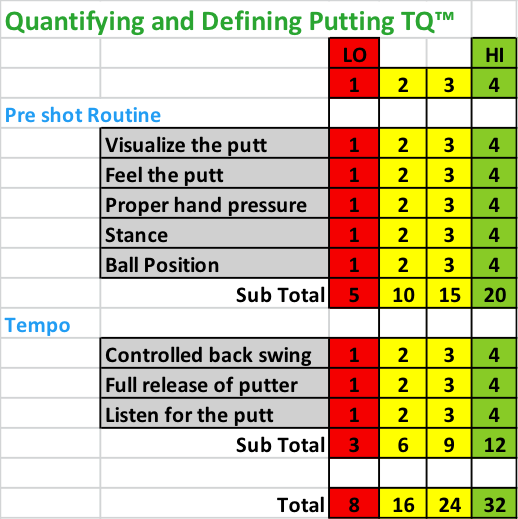 The goal of quantifying TQ™ is to stress the importance and relevance of confidence to a successful outcome for the new golfer by pinpointing the area which contributed to the less than desired result. As a teacher of new golfers, once TQ™ was explained and the new golfer understood its importance, we began to dialog in unique shorthand. 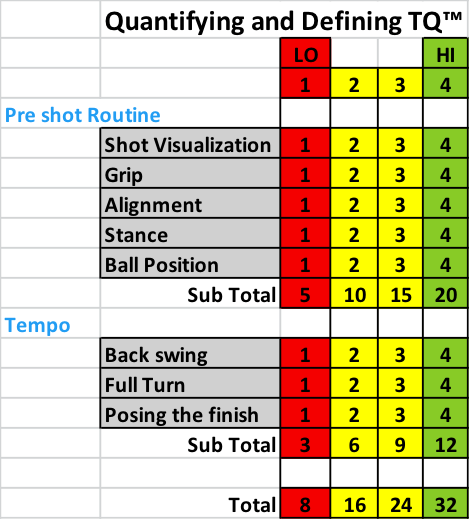 Simply saying TQ™ during the pre-shot routine or the initial approach to a putt would engage the golfer into a checklist of the factors contributing to their confidence. Eventually, the golfer develops a sense for self-evaluation using TQ™ automatically following a poor shot. They go through the checklist and take notation of what they may not have had full confidence in. The tool offers immediate validation for any shot – good and not so good. For a teacher TQ™ offers a consistent approach to help the golfer self-correct in any setting: range, golf course playing lesson or back yard.